Highly versatile, the DP3300 series is a dual input meter. The meter can either monitor two analog inputs or an analog input and a pulse input. On the analog channel, signals from thermocouples, RTD's, or thermistors are linearized and displayed in degrees Centigrade or Fahrenheit. Voltage and current signals are displayed in engineering units. Scaling is easily done from the front keys. A three digit engineering units are programmable for recognition of the process being monitored. (e.g. Lbs, PSI, YDS). 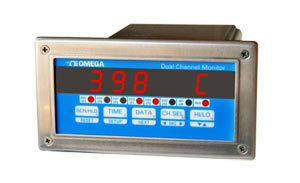 The pulse Input on channel two can be programmed as an up/down counter, rate, rpm or frequency monitor. Scaling allows for converting incoming pulses to engineering units (e.g. pulses from a flow meter can be scaled to display flow, rate of flow etc).In counter mode, the unit offers three presets along with built in delay timers. As a rate indicator, it offers a programmable time base from 0.100 to 9999.999 seconds. In RPM mode, the channel counts incoming pulses and displays the data as revolutions per minute. In frequency mode, an internal crystal reference is used to indicate the frequency of incoming pulses. Options include 220 Vac and 15 Vdc power supplies, either six relay or open collector outputs.